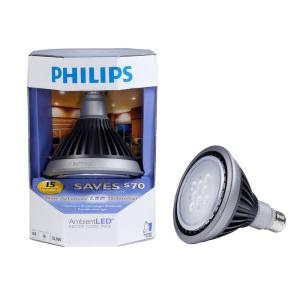 I was wandering through the eco-friendly section of the lighting department of Home Depot the other day in search of a replacement bulb for the recessed cans in the kitchen when I spotted something new - LED downlights from Philips. Normally I'd be the first one to jump on an eco-friendly upgrade (which is why I have 6 different bulbs in my kitchen - all different lumens and kelvins) but the price made me choke. The Philips Ambient LED was pennies short of $70. To do the job properly I should replace all 14 lights in the kitchen, plus the three in the mud room/corridor, which would cost ::GASP:: well over a thousand bucks. 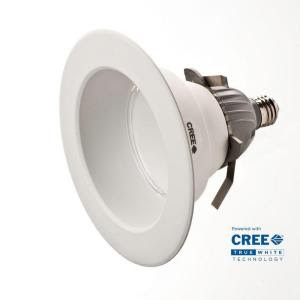 When I got home I started to look around for other LED manufacturers and found one Cree Lighting that offers an Ecosmart bulb for an affordable $50. The company claims each bulb will save $300 over its lifetime and that lifetime should be a long 35,000 hours or approximately 30 years. They are basically telling me I'd never have to change a lightbulb again. And the video shows how simple it would be to install. What do you think? Obviously no one can test the veracity of the claim to the longevity of these bulbs but has anyone out there tried these LED lights? Is the Easy White color as natural as they claim? Is there a reason they are twenty dollars cheaper than the other brands? I'd really like to have the lighting issue in the kitchen sorted once and for all but I can't justify spending such a huge amount of money on a promise. $70 is too much but $50 is affordable? Doesn't seem like that big a difference to me! To be fair it is 28% less but still a whacking chunk of change for something I haven't seen lighted up... and I could buy 5 CFL floodlights for $50! Gosh. I'm curious about the quality of the light they produce. And, not having to change them ever - that's a good thing. But, I think these sorts of lights will have to come down in price. Like you, I have several lights in my kitchen ceiling and to replace them all with one of these new led/eco lights would be prohibitive.